Once again, Winston Wächter Fine Arts is exhibiting my Big Appetites large format photographs at their booths at Miami Project and the Pulse Contemporary Art Fair from December 1 through December 6, 2015. My work was very popular at last year's fair with many red dots and pieces going home with collectors. So I'd advise you to visit early to see the best selection of Big Appetites work as well as all of the other stunning work of Winston Wächter's roster of artists. My "Rare Animal Breakout" (2012) piece is one of a handful of Big Appetites photographs that will be exhibiting this weekend at the Seattle Art Fair. This particular piece is apparently popular with the Minneapolis dentist demographic. The caption: "The animals had but a brief taste of freedom before the poachers tried to reduce them to crumbs." Winston Wächter Fine Art will be debuting three new Big Appetites works (Champagne Scuba, Cotton Candy Hot Air Balloon and North By North Whipped) at this year's Art Market Hamptons, which is now being called "Market Art + Design." The show will be held in a stunning new waterfront venue at the Fairview Farm at Mecox in Bridgehampton, NY from July 9 through 12. More information about tickets and times can be found on the exhibition website. Bridgehampton, NY is also home to the luxury boutique hotel Topping Rose House which has a large number of Big Appetites works in its extensive permanent art collection. Big Appetites fine art photographs are part of a late spring group exhibition in Toronto at Marcia Rafelman Fine Arts. There will be a sneak preview on Wednesday, June 3rd from 10am-5pm, an opening reception on Thursday, June 4th from 5-8pm, and then the show will continue to run (viewing by appointment only) until July 10th. Sometimes the image finds you. Zesty Mower. Photographed on July 24, 2011. Zesty mower is one of the more popular images in the Big Appetites series. It is also one of the most accidental. Two of the most common interview questions I get are “Where do you find inspiration for images?” and “How long does it take you to create a photograph?” In both cases, I usually use Zesty Mower to address both of those questions. Inspiration can really come from anywhere. You just need to be open to it when it arrives. On the day that Zesty Mower was made I wasn’t even in the studio shooting. I was organizing a drawer of kitchen tools and found a forgotten citrus zester. I went to the fridge, took out an orange and began to make a long strip of rind. My mind immediately went to a memory from back in college when I watched one of my roommates peeling a kiwi fruit with a knife. He didn’t take the peel off in little bits, as I would have, but instead made a long, unbroken strip of peel from start to finish. If I asked him about it today I doubt he’d remember this thoughtless act. But for some strange reason it made an indelible impression on me: the slow, deliberate care he took as he drew the knife towards his thumb, and the way he rolled the fruit in his hand, the bright green of the kiwi flesh against the taupe brown of the skin. Sometimes being a good artist means being observant of some of the most simple details of life: movement, color, texture, light. The most elegant and basic things in the world are also the easiest to miss. With a long, unbroken piece of orange rind the idea hit me in an instant. I set up a green backdrop, placed the orange and peel just so and then went to my archive of figures. It just so happened that I had a figure with a lawnmower and the gauge of the mower seemed to perfectly fit the width of the channel of rind and pith. Out came the tripod, a camera body and a lens. Using natural window light and a reflector I made 64 frames in the span of about 10 minutes until I worked through a range of apertures and had the image I wanted. Sometimes I’ll spend a few hours working in the studio and in that time I’ll do a few different images. Or I might shoot one set-up a few different ways. On occasion, once I import the digital images into my computer and begin the editing process I’ll be unhappy with what I have, or I’ll see a mistake that wasn’t so obvious. So I’ll go back and do reshoots. Every photograph has its own process so it is difficult to say what the average time is. I also don’t keep track of the time spent shooting so most of my answers about that metric are always a best guess. (I’ve always been a terrible judge of time). But one thing is for sure, Zesty Mower happened quickly and came to me without much trouble. A discarded test frame without lighting or color correction, and prior to digital cleanup of the various flaws in the fruit. My image of a woman mowing an orange was selected to be on the show card for my first Seattle fine art exhibition. A couple of serious local art collectors, with a legendary art collection and close ties to the Seattle Art Museum, purchased one of the very first Zesty Mower prints for their collection at that show. The image was selected for the cover of my Big Appetites book. It has been licensed for countless publications and websites. It is featured in my notecard line. And fine art prints of this image have sold so well all over the world that it is getting close to the end of the edition in all sizes, at which point no more will be made. Zesty Mower in the collection of the luxurious Topping Rose House resort in the Hamptons. Zesty Mower on the bestselling Germany edition of Big Appetites 'Riesenhunger' published in 2014. Sometimes you just stumble into a good image. I can spend hours on a set-up sometimes, with elaborate sketches and all kinds of figures that keep falling over and needing to be reset. aAnd yet when the image is finished no one seems to connect with it. I might like it but maybe my galleries don’t, or think that the context isn’t clear, that it isn’t commercial or it won’t sell. And then, as further evidence of the dubious quality of my so-called genius, I’ll stumble into an image like Zesty Mower and it instantly resonates with people who see it. I know fine art photographers who have had a career for 30 years and even they admit that they still don’t fully understand what makes a successful image. I relate to that sentiment and I respect the humility. Sometimes you just need to get out of the way of it and let the work speak for itself. I am often asked where I derived the inspiration for creating work with tiny figures in a world of big food. It always sounds to me as if the person asking thinks it is some odd, abstract idea that was hard to come by. But in truth, when you consider how common the concept of mixing scale (scale juxtaposition) is in the media it's almost incredible that contemporary artworks with elements of mixed scale aren't more common. When I was a child I was particularly attracted to the story of Gulliver's Travels and principally with the Lilliputians. Published in 1726 as a social satire, the idea that people of vastly different scales could exist in the same world was fascinating to me. The dramatic and comedic potential of the concept definitely holds up, whether it is being employed in the 18th century to skewer human nature or in a 21st century comedy like 2010's Gulliver's Travels with Jack Black, which is just the latest of many adaptions for the screen this story has had. Though it was the primary mixed-scale story that made an impression on me, it was hardly the first instance of this in literature. There are many classic tales of giants stretching back into mythologies of various cultures, and even in the biblical story of David and Goliath. What child has not heard the classic children's story of Jack and the Beanstalk or read Lewis Carroll's story of Alice's Adventures in Wonderland? Both stories involve characters who deal with issues of scale. Another childhood favorite – and no doubt one that inserted into my subconscious the idea of tiny people with large food – was The Giant Jam Sandwich by John Vernon Lord. Published in 1972 the book was about a town besieged by giant wasps. The townsfolk decide to build an enormous jam sandwich to trap them. I won't spoil the outcome. The book is still in print. Almost as soon as motion pictures were invented the industry was exploring clever special effects (including mattes, composites, back projection, etc.) to achieve both something visually interesting that served the story but that would also save money by obviating the need to build large practical sets, as in 1902's Le Voyage dans la Lune or Fritz lang's iconic Metropolis in 1927. The field of fantasy and Science Fiction cinema burgeoned in the 30's and 40's and particularly came into its own in the 1950's as films became more creative and spectacular in the face of rising competition from television. It is in the 1950's where we begin to see scale juxtaposition used to great effect in films like 1957's The Incredible Shrinking Man and Attack of the 50 Foot Woman released the following year. There was a dramatic mix of scale to be found on television too. Land of Giants from 20th Century Fox Television aired 51 episodes on ABC from 1968-1970. Set in the (then) future year of 1983 the premise was a group of people who while traveling from Los Angeles to London on some kind of high-speed space plane encounter a weird storm and crash land in a place where everything is vastly out of scale with their bodies. Not every instance of scale juxtaposition is center stage in the plot. Sometimes you find it at the periphery, as in the scene near the end of 1971's Willy Wonka and the Chocolate Factory in which the character Mike TV jumps up on a platform and beams himself "in a million pieces" to a television on the other side of the room before his exasperated mother retrieves him with her fingertips and puts him in her purse for safe keeping. I think he ends up being sent to the taffy pulling room. My childhood in the 1970's seemed something of a renaissance for films, television and advertising that utilized the concept of scale juxtaposition to sell a plot point or a product. When I was very young I distinctly remember a particular segment of the Captain Kangaroo show that involved a family of tiny people who lived behind the books on his bookcase. I've scoured the Internet in an attempt to find some visual record of this recurring mise-en-scène but I've been coming up empty. Though typing "Captain Kangaroo" in the search field on YouTube generates predictive search terms for "little people" and "bookcase people" which leads me to conclude that others are also searching for evidence of this elusive segment. My recollection is that the characters didn't speak. Every so often the Captain would move a few books aside and check in on the secret world of his tiny friends, living among life-sized animal crackers boxes, Campbell's soup cans and the discarded wooden thread spool they used for a table. By far one of my favorite Saturday morning shows as a kid was the Krofft Supershow which aired on ABC from 1976-78. One of the segments of this show was a serial called Dr. Shrinker. Its premise was a group of teenagers who become stranded on a deserted island with a mad scientist who had invented a shrinking machine. Over the course of the series they struggled to survive despite having the doctor, his henchman and a hungry cat in hot pursuit. That was around the same time that another favorite TV show, 1974's Land of the Lost, often pitted regular-sized people with stop motion animated dinosaurs of towering size. While it is not a classic example of Science Fiction scale juxtaposition – as the people and the dinosaurs are both their proper sizes despite the historical mashup – I did watch quite a bit of this show in reruns and it did have the same look as Dr. Shrinker because it used the same Chroma key special effects. Just as Gulliver's Travels has been remade repeatedly, Land of the Lost has been redone too, first as a television series in 1991 and later as a $100 million Universal Pictures film with Will Ferrell in 2009. The original series had its charms, but one wouldn't think that the cheesy production values of the original would be such rich ground for successive efforts. Beyond Hollywood's capacity for recycling old ideas, I think it demonstrates that the concept of mixing scales is powerful and compelling. If Saturday mornings of my childhood were about the Krofft Supershow, then the afternoons were about the Creature Double Feature on Boston station WLVI Channel 56. Once again, I was being exposed to a mixture of scale in the badly dubbed Godzilla television shows from Toho Ltd., based on the original 1954 film. And once again, Godzilla is another idea that apparently has been compelling enough to be remade multiple times. Virtually identical in concept – another large monster rampaging through a civilization a fraction if its size – was the 1976 Dino De Laurentis film version of King Kong that fascinated me as a kid. I had this movie poster on the wall in my bedroom for a number of years. And on my first trip to New York City my brother and I insisted that our parents take us down to see the World Trade Center and the place where King Kong met his demise. The memory added poignancy to the experience I had years later, as a resident of lower Manhattan, watching with my own eyes as the iconic towers of the World Trade Center disappeared from the skyline and fell into a cloud of gray dust. King Kong too has had multiple iterations: from the 1933 original with Fay Wray to the contemporary 2005 Peter Jackson blockbuster. I prefer the Jeff Bridges and Jessica Lange version from '76 as it was the first version I saw. 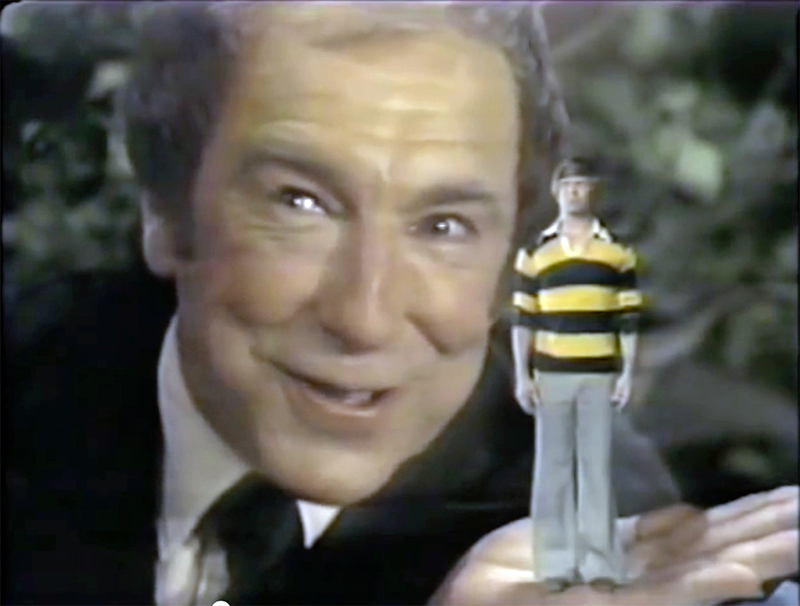 Another film that made a strong impression when I was a kid was 1981's The Incredible Shrinking Woman. A comedy satire about the prevalence of chemicals in our modern society, the movie starred Lily Tomlin and Charles Grodin. This one is a bit different in that the process by which Lily Tomlin's character Pat Kramer gets smaller happens gradually over the course of the film, as opposed to going instantly from large to small as in so many other movies. I think the film is also particularly good at exploring a vast range of emotions, from the initial comedy of a person trying to cope with her rapidly diminishing size (having to wear her daughter's doll's clothes), to the real danger of being gobbled up by the garbage disposal in the kitchen sink. I recall my that my mother visited family in Los Angeles several years after this film was released and during a tour of Universal Studios she was able to interact with some of the leftover, oversized props from the film. Just as the life-sized piano sequence in the 1988 20th Century Fox film Big became iconic because of the fun that the characters demonstrated on screen, people seem to not only enjoy the idea of tiny people but also the absurdity of becoming tiny themselves (if only for a moment) in contrast to oversized toothbrushes, shopping carts and other props. While being exposed to periodic scale juxtaposition at the cinema and on television shows, there was also TV advertising that commonly featured a litany of tiny mascots or some kind of mixture of scales that was meant to grab your attention, from the Rice Krispies guys, to the Keebler Elves, to the Jolly Green Giant to the Pillsbury Dough Boy. Of course, who could forget the tiny Ty-D-bol man in his mini motorboat negotiating the chemically dyed rapids of a toilet bowl? Another favorite was the Ralston Purina chuck wagon. In this commercial, a tiny horse-drawn conestoga wagon would go racing past a dog which would give chase into the kitchen where the wagon would disappear ghost-like into a cabinet while the dog would make a bee line to a waiting bowl of Purina Dog Chow. ©Ralston Purina Corporation. Circa 1975. Ad agency unknown. And just to prove the power and resiliency of the concept of scale juxtaposition, here is an example of a 2012 print advertising campaign for a line of Ben & Jerry's frozen yogurt that is obviously very close to the spirit of my Big Appetites work. Can you think of other advertising concepts that are still just as effective over decades? There can't be very many. Moving back to the realm of cinema, another film I enjoyed in the 80's was the 1987 Warner Brothers film Innerspace with Dennis Quaid and Martin Short in which a scientifically shrunken Quaid pilots a kind of space capsule through Martin Short's body. And of course I must mention Disney's Honey I Shrunk the Kids which did huge box office on a small budget back in 1989. This film comes up quite a lot when I speak to kids of all ages during school talks and art exhibitions. Despite the 26 years that have elapsed since the film's release it is clear that new audiences are discovering it and its sequels – one of which played with scale in the opposite direction with a child blown up to ginormous size. A number of people I've spoken to at exhibitions have mentioned the Borrowers. Based on a 1952 British book, with a number of television and film adaptations, it wasn't one of my influences for Big Appetites. Though I did see the 1995 film adaptation of another British book that involved tiny people in an out of scale world: The Indian in the Cupboard. There are a range of other films that could be mentioned here, including James and the Giant Peach, Cloudy with a Chance of Meatballs or even PIXAR's Toy Story series in which out of scale people, objects, food and toys are mixed together for effect. The point really is that scale juxtaposition is a strong, culturally recurring construction with a ubiquitous presence in literature, cinema, television and advertising. It speaks to a strong human interest in not only miniature things but also how those things exist in contrast to other objects (and people) of varying scales. Upon reflection it makes complete sense to me that being immersed in this concept in my childhood would provide strong inspiration for the Big Appetites work I would begin creating in late 2002. If you know of other movies, shows or advertising that plays with scale, or I've forgotten one of your favorites, please mention it in the comments. All text © 2015 by Christopher Boffoli. All Rights Reserved. Like all Big Appetites photographs, Powdered Sugar Snowblower began with an idea. Many of my image designs are developed on-the-fly as I'm working in the studio. But occasionally an idea will just come to me in a flash and I'll grab a piece of paper to make a sketch in advance. This one happened that way. The basis of this design was a man with a snowblower working through thick powdery sugar that was blown onto some nearby doughnuts. I made a very rough pencil sketch on a scrap of paper on the morning of Monday, January 19th when I began to hear about the huge snowstorm approaching New England. It had me thinking of some of the huge blizzards I experienced as a kid growing up in Massachusetts. It was a simple, clear idea so I expected it wouldn't be difficult to pull off. I started with a bit of planning on what I would need for materials and then did some research for the figures. Early on in the production of this series I was able to create my photographs with injection-molded, plastic figures made for model building. But in recent years, as 3-D printing has improved, I've focused more on custom designs for all of my figures. Snowblowers are also fairly specialized so I expected they'd have to be created from scratch. Snowblowers are common in New England where I grew up but aren't really needed here in urban Seattle where we don't have much snow. So I hadn't seen one in a while. I found some images on the web to refresh my memory on some of their design details and then discussed the construction details with one of my designers who did the 3-D modeling. From there the figures were fabricated in a translucent plastic that renders fine detail very well. 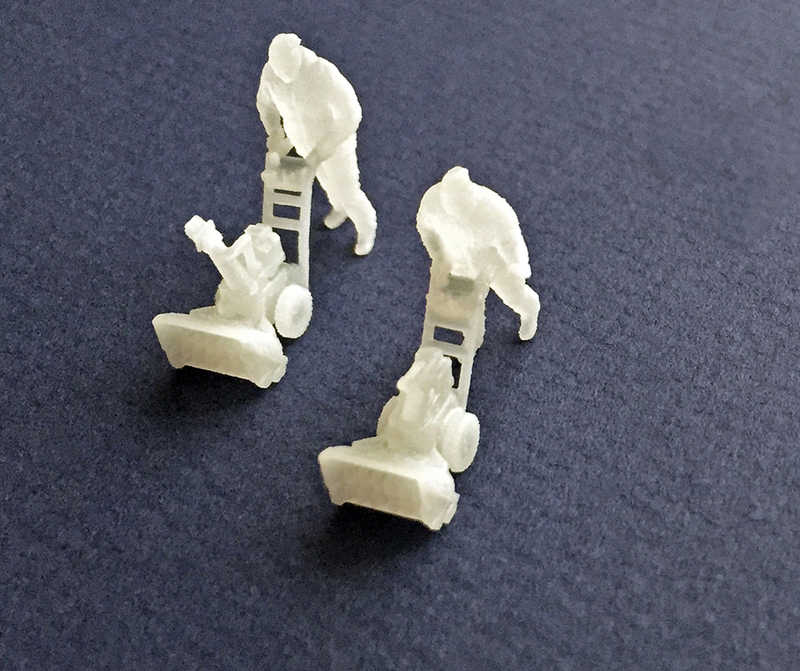 These figures are tiny but you can still see the texture of the tire treads. It is impressive how quickly the field of 3-D printing is evolving. Just a couple of years ago it was much more difficult to successfully print the kind of small details that are easy to do now. After a few hours of meticulous painting the man and his snowblower were ready to go. The diorama was arranged on a thin sheet of board with a roll of gray paper over it. Once that was clamped at the top and taped down at the edges, a coat of cake frosting was spread over the surface. This would provide a thick base that would help to hold the powdered sugar in place. The sugar was applied using a cake sifter. The doughnuts were arranged and then rearranged. Then I used the square end of a thick chopstick to carve a channel through the "snow" and placed the figure. The front of the snowblower was dipped into the sugar so that the blades at the front would look more realistic. Some more sugar was dusted over the scene. I made some adjustments to the edges of the snow around the figure so that he was more visible. The key light here is natural window light at the left of frame. And then a large reflector is used on the right to bounce some light down. I'll usually try several different camera levels and positions and will run through a range of aperture settings so I will have choices later while editing. In this case, about 75 frames were shot before I was content that I had it. One of the last elements of this image was the sugar (snow) blowing out of the snowblower. I had previously set up and shot this as a separate element that I planned to layer in later. This involved blowing fine baking powder (as powdered sugar attracts water in the air and tends to get clumpy) through a drinking straw. It is never fun to work with powders in the studio as fine dust and camera equipment are generally incompatible. This time was no exception. But sometimes you just have to do it to get the effect that you need. Ultimately, it didn't work out as planned. I was never able to get the layers to work very well and ended up painting in a quick-and-dirty snow plume in Photoshop, which is fine for a low res image but will have to be carefully redone before this photograph can be added to my fine art catalog for collectors. Overall, I'm happy with how the photograph turned out and how it has been received so far. The next step will be animating this image.